KATHMANDU, Nov 14: The srket saw significant strength in the initial hour of Tuesday's trading. The bourse witnessed a broad rally as the Nepal Stock Exchange (Nepse) index gained more than 15 points by the afternoon. Though the index gave up some of its gains in the closing hour, it still logged gains of 13.97 points to close the day at 1,207.31 points. The index moved above the 1,200-point mark following the day's gain, snapping its two-day losing run. Investors seemed enthused in taking comparatively significant position in the day as the official website of Nepse showed some improvement. 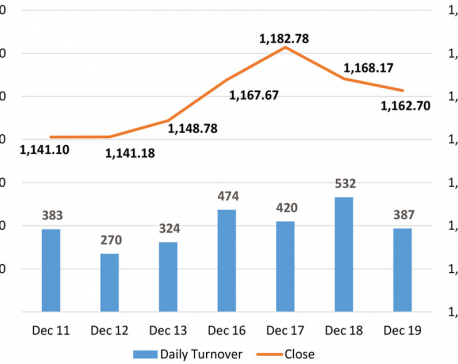 Trading activity was marred by glitches in the previous two sessions following the inauguration of online trading platform before Tihar holidays. Subsequently, the bourse recorded a total turnover of Rs 174 million. Majority of the traded sectors followed the broad index with maximum gains coming from Hotels stocks. The group's sub-index jumped by 2 percent. Life Insurance and Banking sub-indices were also among the major contributors to the day's surge, as their sub-indices went up by 1.4 percent each. Non-life Insurance sub-index added 1.37 percent on the day. Except Finance, all other groups ended the day in green. In terms of turnover, Prabhu Bank Ltd continued to lead the list of active stocks as more than Rs 14 million worth of the its shares changed hands on the day. Subsequently, shares of Api Power Company Ltd logged turnover of over Rs 11 million. Next, NIC Asia Bank Ltd posted a turnover of over Rs 8 million. Similarly, Rs 7 million each worth of shares of Mega Bank Ltd and Nepal Life Insurance Company Ltd were traded on the day. Among advances, shares of Unnati Microfinance Bittiya Sanstha Ltd rallied by almost 10 percent on Tuesday after the micro-sector lender announced 40.50 percent bonus shares to its shareholders. Further, shares of Arambha Microfinance Bittiya Sanstha Ltd also surged by 5 percent. Meanwhile, Saptakoshi Development Bank Ltd and Mirmire Laghubitta Bittiya Sanstha Ltd posted gains of over 4 percent each. Prudential Insurance Company Ltd, Oriental Hotels Ltd and Manjushree Finance Ltd were among other top gainers of the day. NMB Microfinance Bittiya Sanstha Ltd, on the other hand, were the biggest loser as its share price tanked by 8.57 percent. Similarly, share price of Himalayan Power Partner Ltd tumbled by 5.82 percent. Everest Insurance Company Ltd also saw its share price slump by 4.76 percent. The insurer is set to issue 105 percent promoter right shares to its shareholders from December 2. Hydropower stocks followed suit as share price of Arun Kabeli Power Ltd and Arun Valley Hydropower Development Company Ltd fell by 4 percent and 3.17 percent, respectively. Among the companies publishing their earnings reports on Tuesday, Global IME Bank Ltd and Standard Chartered Bank Ltd reported growth in their net profits by 36 percent and 26 percent year-on-year, respectively. ARKS technical analysis indicates the index forming a bullish candlestick as the selling pressure eased off, pulling the market above the psychological 1,200-point level. Nonetheless, with below average trade volumes of late, a significant reversal from the downtrend is yet to be observed.